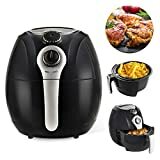 If you haven’t gotten in on the action yet with the air fryer craze, trust us when we tell you that you need to right away. This isn’t just some lame trend that’s going to disappear before you know it. Air fryers cook up crispy, delicious food with almost no oil at all. Deep frying and pan frying are delicious, but they’re also going to kill you. Hop aboard the air frying train with Amazon’s huge sale on the Simple Chef Air Fryer. It retails for $170, has 3.5 liters of capacity, and has a killer 4.3-star rating… and yet it’s only $63.99 today on Amazon! SATISFACTION GUARANTEED – Were confident that our high-quality product will leave you satisfied. We offer a 30-day guarantee if you’re not 100% satisfied, simply contact us to return the product for a full refund.